Unseasonably warm weather has put us ahead of schedule in the greater Thunder Bay area. At this time last year we had snow along Superior’s north shore. This spring we’re in t-shirts steelhead fishing. Ironically, as I’m writing this snowflakes started falling. Regardless of the weather, steelhead have started to migrate into our tributaries and anglers are taking advantage of the recent early run. 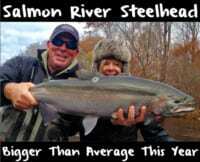 This includes several local rivers, including urban streams in Thunder Bay that offer excellent steelhead fishing. With good steelhead populations, restricted harvest, great habitat restoration and protection efforts by the North Shore Steelhead Association these local fisheries remain healthy and accessible. Thunder Bay rivers are often the first to hold fish. The bite has been good for a week and should be productive for the next month as fresh continue to move in. Drop backs provide opportunity following the spawn. The steelhead run in tributaries east of Thunder Bay is in the preliminary stages and will improve daily. These rivers produce fish into mid/late May. Normally, I target them between Thunder Bay and Marathon (about three hours east), but if you want to drive further those systems harbor steelhead, too, and see less pressure. I’m a dedicated float fisherman and use cured roe almost exclusively, namely brown trout roe cured in BorX O Fire and steelhead roe cured in Fire Cure. 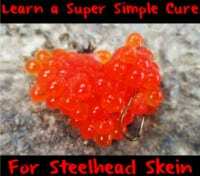 I prefer having a variety of roe cured in different colours and tied in a several colours of scarf. It’s important to have options for different water conditions. This way you can experiment if things are slow. The last few years purple scarf and natural colour eggs have been my favourite. However, for dirtier water I’ll bring orange cured roe tied in orange or pink scarf. One trick I use is when runoff clears I’ll downsize to small Natural BorX O Fire cured roe bags tied in purple scarf. Running this one a size eight or 10 hook has been effective. Even downsizing to cured single eggs or Pautzke’s jarred single eggs can be a great finesse approach. Downsizing is effective in clear water, when fish are finicky, are in spawn mode and have been seeing big roe bags roll past them for weeks. The run is happening now and will continue to produce fish for weeks as we welcome spring to Northwestern Ontario. Editor’s Note: Outdoor writer Tom Armstrong resides in the greater Thunder Bay area and fishes as often as he can for multiple species.